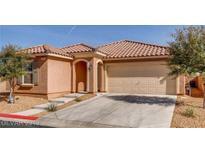 Below you can view all the homes for sale in the Cactus Hills South subdivision located in Las Vegas Nevada. Listings in Cactus Hills South are updated daily from data we receive from the Las Vegas multiple listing service. To learn more about any of these homes or to receive custom notifications when a new property is listed for sale in Cactus Hills South, give us a call at 702-323-5933. Built in microwave, office area, loft. Large walk-in master closet. MLS#2086932. Signature Real Estate Group. Up graded one of the most popular KB floor plans in a gated community with low HOA and low Property taxes brand new stunning PLANK VINYL floors through out the home even the stairs MLS#2086995. Realty ONE Group, Inc.
Open floor plan , all bedrooms on the 2nd floor.. come to see it before it's gone.. MLS#2080448. Evolve Realty. Totally Unobstructed Mountain View, No Homes To The Side Or Behind, Corner Lot, Granite Counter Tops, Stainless Appliances, Upgraded Cabinets, Tile Floors, Fresh Paint, New Carpet. This Is Must See! ! MLS#2070202. Windermere Excellence. Granite Counters w/ Upgraded Cabinets * Spacious MASTER w/ WALK-IN Closet * Rear FRENCH DOORS open to LOW MAINTENANCE REAR YARD w/ Custom Pergola Covered Patio. MLS#2067367. BHHS Nevada Properties.